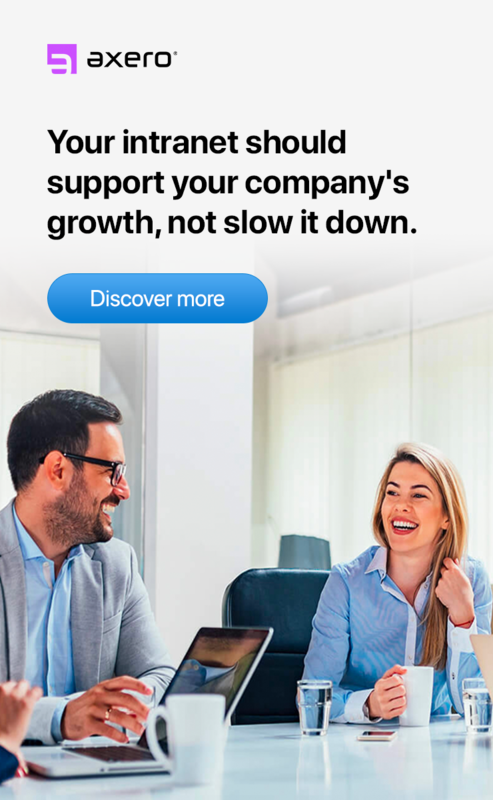 …but maybe more importantly, it also means connecting and engaging your employees in the same location. Yes, this virtual economy is even impacting teams inside the same office. Sure, you hear a lot about the importance of connecting remote teams. But the virtual economy is impacting your employees right there in your own office, too. If you've been a manager for a while, I'm sure you've noticed a mindset shift with your employees. They now instant message each another rather than get up from their desks to talk in person. They answer email outside of work hours. They send digital files to colleagues before meetings, rather than printing them out. The cost of replacing an employee is steep. Some sources, such as ERE Media, say that it costs somewhere around 30-50% of their annual salary to replace an entry-level employee. 150% to replace a mid-level employee. And 400% to replace a high-level or specialized employee. Beyond the cost of replacing employees, unhappy employees represent a much deeper problem in your company. Unhappy employees mean that your company is fundamentally misaligned with the reality of our world today. People love to work at employee-centric companies. And those companies are successful in the marketplace because of it. Look at Google. Look at Zappos. Look at SAS. You might be saying to yourself, "Yeah Tim, but those companies have huge HR budgets to make sure employees stay happy at work." And you wouldn't be wrong. But that doesn't mean smaller companies can't achieve the same results. The fact is, if you don't take care of your employees, you will get left behind in today's economic world. Your employees will leave you for an employer who cares more about them. Keeping employees happy isn't a matter of budget. It's a matter of priorities. Put your employees first and they'll reward you with better work, better customer service, and better loyalty. 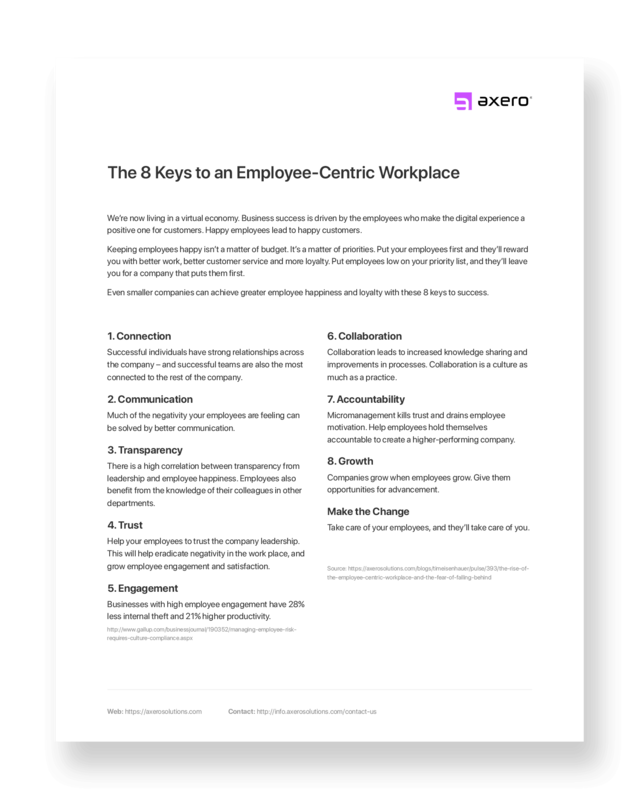 While growing Axero for the last 8 years, I've uncovered 8 keys you can use in today's employee-centric economy. Each of these keys is achievable by small businesses. And I'll show you exactly how you can achieve them at your company. Happy employees feel a connection to each another, and they also feel connected to the mission, vision and values of your company. Ideas, insights and inspiration spread from person to person. Much like the flu. This is what Harvard professor Nicholas Christakis discovered in his investigations. Successful individuals have strong relationships across the company – and successful teams are also the most connected to the rest of the company. Happy employees feel emotionally invested in the mission, vision and values of the company they work for. So don't just pick a mission, vision and value set that “sounds good” and hits all the right industry buzzwords. Talk to your employees and find out what matters to them. Craft a mission, vision and value set that reflects and supports those things. You read that right. I didn't say “talk to your customers.” I said “talk to your employees.” This is a mindset shift you need to make to be successful today. If you're not talking with your employees, they'll find another employer who listens. Give your employees full access to one another's knowledge – and empower them to get to know one another. A company intranet helps you do both of these things. Employees can have internal conversations that can later be turned into knowledge-base content. You can display your company mission, vision and values in a dedicated workspace, keeping them front-and-center for employees to reference. Allow employees to comment on these values – that way you ensure the ideas remain relevant over time, and your employees feel heard. Much of the negativity your employees are feeling can be solved by better communication. To be successful today, you need to improve #1, enable #2 and encourage #3. Communicate changes clearly and with as much transparency as possible. Communicate your company mission, vision and values in a way that employees can relate to and remember. A huge benefit a smaller company has over a larger one is that information can be communicated much more directly – you're not relying on multiple levels of management to cascade information (which is a bit like playing the telephone game). Take advantage of this agility! Give employees a way to communicate to the company beyond the old-fashioned suggestion box. Give them a voice by removing as many barriers to communication as possible. Give them regular, planned opportunities to communicate with leadership – but allow them to have ad-hoc access through mediums such as forums and discussion threads, too. Today's employee is more likely to instant message a coworker than to get up and walk over to his desk to have a conversation. While you should take modern communication practices and preferences into consideration, you should also encourage more face-to-face communication whenever possible for the health of your organization. Chat is a handy tool for quick conversations, but it can also lead to miscommunication. So what happens when communication fails? Your company intranet has solutions for all three levels of communication – from team spaces to discussion boards to private messaging. What you might not know, is that you can also use your intranet to inspire more communication. Gamify behaviors you want to promote and activities you want people to adopt. Reward participation. This will help make communication fun and engaging – and as your company communicates better, your employees will begin to see the benefits. Information silos are a reality for most companies – especially for companies that are built on knowledge and information. Though organizing departments into clear-cut silos used to be a good way to keep everyone focused, today it's a liability. Today transparency and an organizational structure that promotes knowledge sharing is the only way to get ahead. Breaking down the silos doesn't mean that everyone will get unfocused. It means that teams can benefit from the knowledge of other teams. Employees can benefit from the knowledge of their colleagues in other departments. Information flows freely. And as long as you've aligned your company to a single mission, everyone can work toward the same goals together. TINYpulse, the creators of one of the most compelling employee engagement surveys, found that there is a high correlation between transparency from leadership and employee happiness. The company predicts that there will be an increasing push for transparency in the workplace, because Millennials have grown up with information being accessible. Without transparency, you can't have trust (which is Success Key #4). Make knowledge accessible. Create intranet workspaces for subjects that are important to your employees. Build a knowledge-base that leverages the expertise of all your employees. To build a culture of transparency, knowledge-sharing must start at the top. So let your leadership team post on the intranet about changes happening within the company – and prepare to be a part of the discussion that follows it. You don't want to freak your employees out by sharing information about a company change too early. So you default to sharing information on a “need to know” basis. The result isn't employees who feel more secure. The result is employees who feel less trust in the company. No one likes to be blindsided. Especially when it involves their paychecks. In fact, belief in senior leadership is reported by Modern Survey to be the strongest employee engagement driver. It can be hard to have an unbiased view of your own employees, so I'm going to ask you to do something a little out-of-the-box: Listen to what employees of other companies are saying about their experiences. Most companies show very little trust in their employees. This is one of the reasons that the stand-out companies stand out. They've put their employees first, and they've worked to build that trust. Take a note. Help your employees to trust you, and to trust the company leadership. It'll pay off. Open a dialogue with your employees. Find out what's bothering them. Find out what fears they have. Then figure out what you can do to solve those problems. This is the first step to building trust. But don't stop there. Eliminate the causes of mistrust going forward. Stop putting up a wall between leadership and individual contributors. Let management speak its mind and share behind-the-scenes information with employees – even if it's scary. Even if you're worried employees will jump ship when they find out not everything is perfect at the company. You'll be surprised at how this act of humanizing a company can benefit you in improved employee trust. One way you can do this is by openly posting product roadmaps, launch plans, team goals and status reports on your intranet. Does this sound terrifying? I'll reframe it for you. When people can engage with this leadership-level information, they want to know more about how the company makes decisions so they can figure out the best way to contribute. Employee engagement is a huge, huge deal for every single company. It can make or break a company's success. Disengaged employees cost the company in lost productivity and high turnover. On the flip side, businesses with high employee engagement have 28% less internal theft and 21% higher productivity. Engaging your employees is a good thing. It's so powerful, I've got an entire section of the Axero website dedicated to it! But once again, many companies are falling behind, here. Not because they're ignoring employee engagement altogether – but because they're prioritizing it lower than customer engagement. This sounds counterintuitive. I know. But remember, we now live in an employee-centric world. You must put your employees first. From day one of their employment. Otherwise, they'll leave you for someone who will. Improve your onboarding process. Make sure your new employee has everything he needs to get up and running on his first day. An assigned desk, computer, phone, badge… and most importantly, access to information. 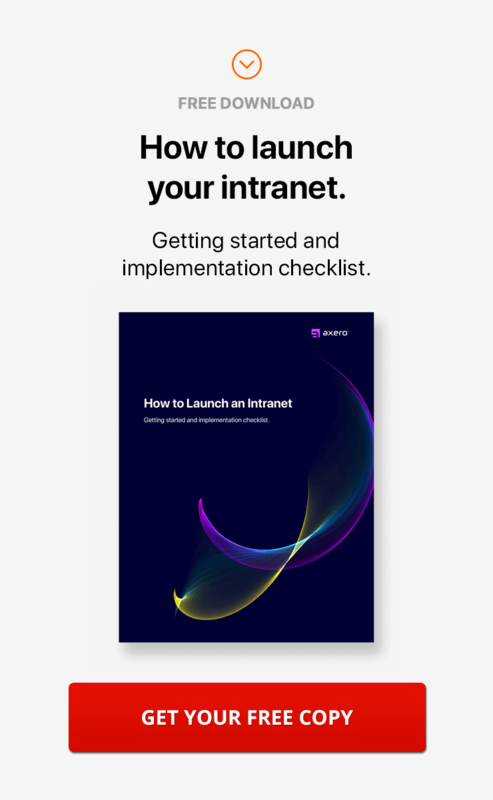 Don't just hand your new employee an information packet and tell them “good luck.” Set up an onboarding space on your company intranet. Make sure all the new-hire paperwork is there and up-to-date, along with any employee handbooks he might need to get started. Have your HR person show the employee around the intranet so he can easily find the knowledge-base, the team page, and the employee directory. Encourage your team to give the new employee a warm welcome. Post about the new hire on your team intranet page. Keep the post open to comments so the new employee can bask in the positive attention on his first day. This is one of the biggest challenges that managers report to us in our customer surveys. Like transparency and communication, collaboration requires people to work together and be open to one another's ideas and knowledge. 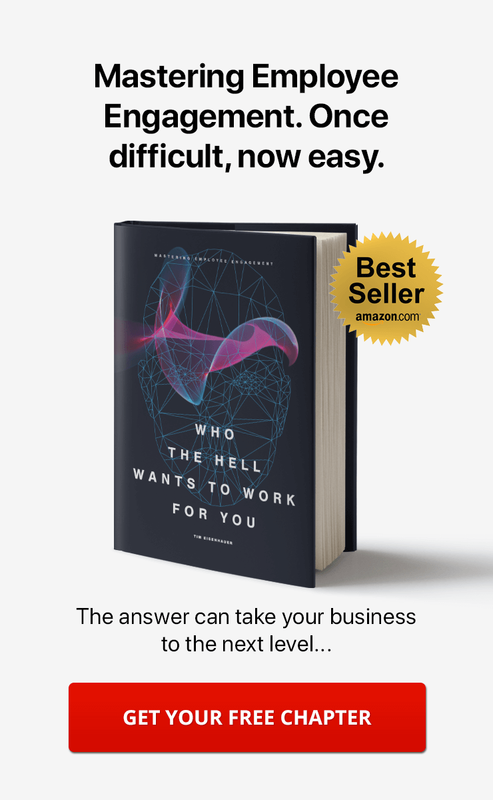 That's not an easy thing to nurture without first helping your people connect – so start there. When individuals collaborate, processes improve because knowledge and ideas are shared more freely. When collaboration is an issue, you see the signs right away. Silos. Information gaps. Red tape. Intranet usage is a great way to measure the collaboration that is (or isn't) happening on your team. Most companies monitor customer satisfaction, profitability, growth and closed complaints. But few companies are monitoring collaboration. Maybe that's why few companies make it in this employee-centric marketplace. Don't fall into the trap. Collaboration is a culture as much as it is a practice. Company cultures like IDEO's are prime to survive because they put collaboration at the center. They expect their employees to work together for the common good. And because that collaboration is incentivized, the employees rise to the challenge. Consider shifting your intranet management system from a gatekeeper model to a collaborative one. Even if your culture isn't yet truly collaborative, this can be a powerful first step forward. Granting employees access to manage the intranet encourages innovation and increases productivity. But it's the aspect of taking ownership that improves collaboration in the workplace. I've written a detailed post about this topic, which you can find right here: How to Shift Your Team Culture to a Collaborative Intranet Management Model. I considered calling this key “non-micromanagement.” Most human beings are capable of being accountable for their work goals – but it's micromanagement that stifles the inclination in most workplaces. Needless handholding kills trust and drains motivation. It's toxic to employees and managers both. When your employees don't hold themselves accountable – when micromanagement rules the workday – you train employees to sit around and wait to be told what to do. Innovation – not possible. Creativity – not possible. Proactive effort – not possible. Lack of accountability leads your company into a long, slow death, complete with growth stagnation and employee turnover. On the flip side, improving accountability can create a trust-based, high-performing company culture like the ones you find at Best Buy. The company was one of many at which Jody Thompson and Cali Ressler pioneered their ROWE (Results Only Work Environment) philosophy. Use technology such as your company intranet to create closer working relationships – and eliminate unnecessary conference calls and meetings. Meetings and calls are an excuse to micromanage. I know this is hard to hear, but you need to trust your employees to do their jobs without the constant check-ins. Work with each employee to establish individual goals that account for the employee's strengths and interests while aligning them with the company's bigger goals. Give them the resources they need to do the job – then let them do their job. Let them ask questions and figure things out on their own. Companies don't grow when employees don't grow. According to a recent survey, 68% of employees say their managers aren't actively engaged in their career development. And 22% of employees who are not getting promoted look to other companies for opportunities to advance their careers. “Most employees don't come to work wanting to do a bad job. They want to contribute, advance and grow. Managers should be all about helping them do that.” – Michelle Markelz in the Profile article, Trash the Ratings. When your employees are jumping ship because there's no room for them to grow with your company, you're left filling empty roles with new employees who need to be trained. Once again, you must put your employees first. Help them grow – they'll do a better job for you, and they'll be more loyal to your company. Create an intranet space dedicated to employee growth and career development. Give your employees ready access to training programs that will help them advance in their chosen careers – and in their lives. Then give them opportunities for advancement. Find out what your employees' career goals are and help them meet those goals right there, with your company. You're living in an employee-centric world, now. If you take care of your employees, they're going to take care of you. This isn't a trend. It's a movement. Don't get left behind. If you intend to keep up with your competitors, keep your best people, and attract new talent, you must do what it takes to help your employees thrive.